Brokers, Facilitators and Mediation. Critical Success (F)Actors for the Safeguarding of Intangible Cultural Heritage. 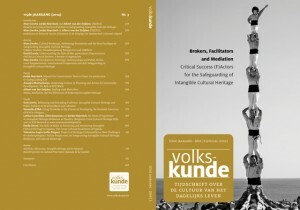 A new publication on cultural brokerage and safeguarding intangible heritage. The 2003 UNESCO Convention for the safeguarding of intangible cultural heritage and the subsequent versions of the Operational Directives have significant effects on cultural heritage practices and policies in many nation-states and regions around the world. Which lessons can we draw from the implementation and evaluation of safeguarding plans and programmes for intangible cultural heritage? What works? What is missing? Can good practices from other heritage fields be inspiring? What can we learn from experiences in development aid, health care or other programmes, in which brokers and facilitators are active? The central hypothesis which is explored is that the role of mediators, cultural brokers or facilitators is important for making safeguarding programmes and other participatory heritage processes work and succeed. Several words describe these roles and the skills required. The word “translators” refers to skills to find common ground between professional discourses, methods and terminology of “safeguarding”or “intangible cultural heritage” on the one hand and local practices and group processes on the other hand. Do keywords like “cultural brokerage” or “mediation” adequately describe these critical success (f) actors? Are these processes limited to the world of NGOs or do they also form a challenge for other organizations, institutions and networks? Brokers, Facilitators and Mediation. Critical Success (F)Actors for the Safeguarding of Intangible Cultural Heritage (Editors Marc Jacobs, Jorijn Neyrinck and Albert van der Zeijden), peer reviewed special issue of Volkskunde. Tijdschrift over de cultuur van het dagelijks leven 115 (2014) nr. 3. Wishing you a fruitful meeting and please if possible share with us the resolutions or any information that might also be beneficial for those of us not yet accredidate by now.